Somali pirates hijacked a German tanker loaded with liquefied petroleum gas Thursday off the Horn of Africa. The ship's 13-man crew was reported safe, even though gunshots were heard over the ship's radio. The MV Longchamp is the third ship captured by pirates this month in the Gulf of Aden, one of the world's busiest shipping lanes. Piracy has taken an increasing toll on international shipping in the key water link between the Mediterranean Sea and the Indian Ocean. Pirates made an estimated $30 million hijacking ships for ransom last year, seizing more than 40 vessels off Somalia's coastline. More than a dozen warships from countries including Britain, France, Germany, Iran, China and the United States now patrol Somali waters to protect vessels. But the warships were not near the Longchamp when it was taken, said Lt. Nathan Christensen, a Bahrain-based spokesman for the U.S. 5th Fleet. Seven pirates boarded the Bahamas-registered Longchamp early Thursday, the tanker's manager, Bernhard Schulte Shipmanagement, said in a statement. Spokesman Andre Delau said the ship's master had been briefly allowed to communicate with the firm and had said the crew of 12 Filipinos and one Indonesian were safe. "We think that everything is in order, nobody is injured," he told The Associated Press. Robin Phillips, deputy director of the Bahamas maritime authority in London, said the Longchamp had been traveling in a corridor secured by EU military forces when it sent a distress signal before dawn. "Ships and helicopters were dispatched, but they arrived too late," said Phillips, adding that gunshots could be heard over the radio. He said the ship later set a course for Somalia, to the south. Christensen said the ship was seized off the southern coast of Yemen, about 60 miles (95 kilometers) from the town of al-Mukalla, the capital of the Hadramaut region. He also said 21 ships since Dec. 1 have taken "aggressive, evasive maneuvers" and successfully evaded pirate attacks. Noel Choong, who heads the International Maritime Bureau's piracy reporting center, said Thursday's hijacking was the first attack since Jan. 14. For the past two weeks, strong winds have made it difficult for pirates to launch their small boats, but the weather has now improved, Choong said. There have been 15 attacks so far this year, and three ships seized, he said. Cyrus Mody of the International Maritime Bureau said 166 crew on nine ships were still being held off the coast of Somalia, not including the Longchamp. 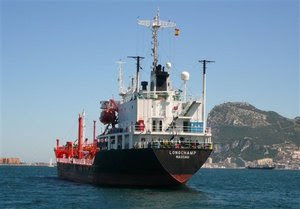 Six other hijacked ships have been released this month, including an oil tanker freed for a reported $3 million ransom. Somalia, a nation of about 8 million people, has not had a functioning government since warlords overthrew a dictator in 1991 and then turned on each other. Pirates see its lawless coastline as a haven. Also Thursday, an official said the breakaway Somali region of Puntland had agreed to a French request that it take custody of nine suspected pirates arrested Tuesday by France. "We consider them to be a real threat for the regional security and the world, as well," said Abdullahi Said Samatar, the Puntland security minister. The German military reported two more suspected attempts by pirates to attack ships in the Gulf of Aden early Thursday. A German navy frigate received an emergency call from a cargo ship, the European Champion, which reported that it was being followed by a skiff. A military statement said the skiff backed off after the German ship sent its on-board helicopter to the scene. A second cargo ship, the Eleni G., radioed that it was being pestered by several skiffs. A German frigate sailed toward the ship, which shook off the suspected pirates. Associated Press writers Katharine Houreld in Nairobi, Barbara Surk in Dubai, United Arab Emirates, Mike Melia in San Juan, Puerto Rico, Simone Utler in Hamburg, Germany and David Rising in Berlin contributed to this report. The Somalian punishment for piracy, under sharia, is the removal of heads, arms, or other appendages. I guess these pirates careers are coming to an end. I have no sympathy for them.